3 exhibitions focused on the latest challenges facing the construction sector. Le Mondial du Bâtiment is one of the leading international events for the building and construction sector, and will take place at the Paris Nord Villepinte exhibition center from 6 to 10 November 2017, in Paris, France. Every two years, INTERCLIMA+ELECHB, IDÉOBAIN and BATIMAT showcase the construction materials and solutions for the buildings of today and tomorrow. In an industry with a positive outlook but which is undergoing profound changes, the 2017 edition of Le Mondial du Bâtiment seeks to help professionals capitalise on the recovering market by helping them understand the new issues facing the construction sector and presenting the solutions. New hall organisation with 6 specific, interconnected trades within a single venue to better discover the broader range of products and solutions. Specialised information before, during and after the exhibitions to understand future trends. A blog and monthly e-newsletters for each exhibition will explain trends and changes in the construction sector, focusing on 5 themes: Comfort and Energy in the Tertiary Sector; Living Bathrooms and Interiors; Sustainable Construction; Building of the Future; “Regard sur l’architecture” (Architectural Perspectives). “Des Hubs des Solutions” will be located in the hall entrances with experts to present assembled solutions that meet the expectations of designers, builders, operators and users. Keynote speeches will be organised in major thematic sessions to inform visitors about key issues affecting the industry. Project owners and contractors will be invited to speak and share important testimonials. “Live” innovations areas with demonstrators will present winning products from the Innovation Awards. Suggested visitor itineraries will be created to get straight to the point of specific topics. Le Mondial du Bâtiment is a show where the building industry can share current and future challenges. 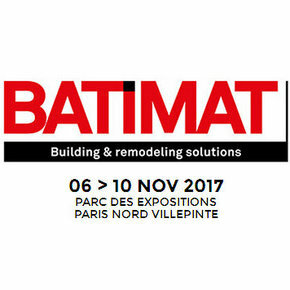 Batimat attracts architects, specifiers and other industry professionals from across the world including many from the UK. Le Mondial du Bâtiment and its three exhibitions are extending a special welcome to French-speaking countries throughout the event.